All thoughts and opinions are totally my own... Promise! And so the Requests continue... Boy, I'm slow! There was a time where I completely ignored Kikkawa Yuu and whatever she did, and it was around this time that her third single, Konna Watashi de Yokattara was released. Why am I bringing Kikkawa's third single up now? Well, after asking for Requests, Aleria has requested this song - so here we are. Now Kikka is far from my favourite artist, and her early work is not some of my favourite since her debut. More so, I love her 2012 works over her 2011 singles. Sadly, I do think that how I view Kikka's 2011 singles is down to Hapi Rapi Sunrise, because that was a terrible song and it pretty much obscured how I saw Kikka after that. Luckily Koko Kara Hajimarunda is fantastic and allowed me to appreciate Kikka once again, but I'm still a tad wary of her. Much like Hapi Rapi Sunrise, this song does not fall into the category of my most liked or over-looped songs. Thankfully this song isn't as infuriating as her previous single, but I'm still not overly fond of it like I was Kikkake wa YOU or Darling to Madonna. Sadly, I'm not a fan of Kikka's voice in this song, either. It gives me a headache, which sounds horrible, but it's the truth; she sounds like she's forcing herself too much here, and it hurts my head. Kikka: The stall on the left is free to use. It's also a very boring song in my opinion. 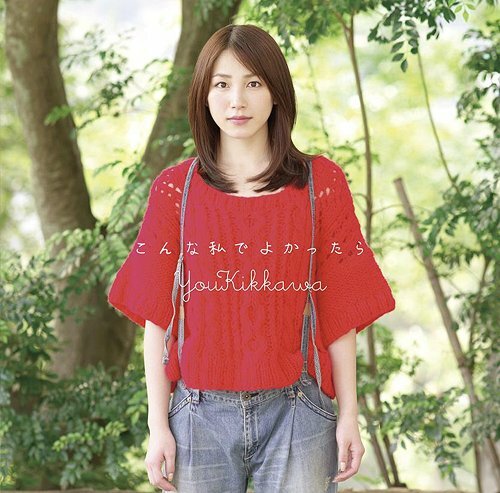 It isn't one of Kikkawa's best, but it does sound different which I give it props for. It's not as generic or peppy as Kikkake wa YOU was, nor is it as infuriating or headache inducing as Hapi Rapi sounded. This song is a lot more bearable, I will admit that, and it has a nicer sound to it, but I don't think that Kikkawa herself suits the song. That, or her voice simply does not appeal to me, which I already know, but this may be news to you all. 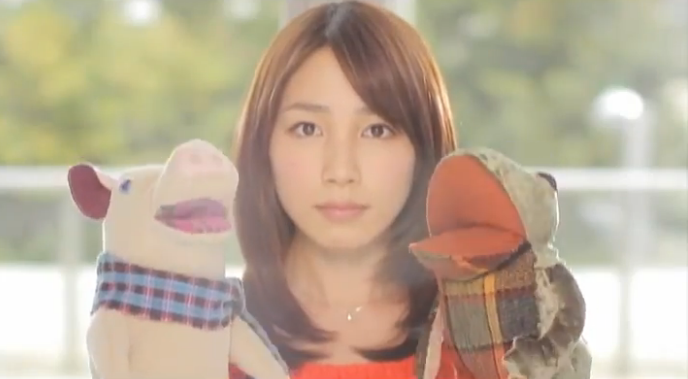 The PV isn't really much for me either, and doesn't save Kikkawa in how much she bores me throughout her performance. I constantly wondered why her agency had asked her to dance and act pretty in the public restrooms beside the stalls, or why she had puppets. 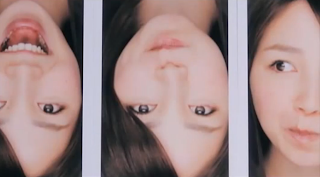 There were some aspects I genuinely did like about this video, but that's pretty much limited to the scenes where she has clones or when pictures of her appear and move from one to the other. I loved the concept of the pictures, actually, and I would have liked to have seen stop-motion used in this video with the pictures. It would actually be a lot more interested than the rest of the video, in my opinion. Another good thing about the video is the pace. It's very fast, every clip is cut to the beat perfectly and it works really well with how fast and well-paced this video is. I actually enjoyed the editing style of this video mostly, because other than the cloning tool and Kikka's pictures, nothing else really stood out to me in this video - not even Kikka herself, save a few close-up shots where she looked happy. Other times she looked plain bored, soulless and disinterested in her job - especially in a few of the dance shots. I think that one of my main problems with Kikkawa as a whole is actually how she comes across. Most of the time she seems like she doesn't care, as if she wants to be somewhere else. The puppet scenes are a prime example of that, and it honestly bothers me when I watch any of her video's. Luckily her more recent singles don't show that, but in her earlier singles Kikkawa didn't really lend any of her personality to the video's or her performance. It bored me then, and it still bores me now with how off she seemed. It honestly feels like she's only doing it because she has to, and not because she wants to. I don't mind Kikkawa, it's just I have my own problems with her. I know that a lot of people adore this girl, and they have every reason to because she's a fantastic singer and a great performer, but in the early stages of her career, I didn't care for her, and I still don't care for her during her 2011 début era. I found her boring, I felt like her performances in front of the camera weren't genuine, and she was pretty unbearable at times. It was during this point that I wanted to ignore Kikka, and whilst it only lasted for one single (coincidentally, this single), I was quite happy not listening to what she brought out because I could not stand her voice or her performance in front of the camera. There's a lot of negativity here, I know, but I want to ask; What do you guys think of this single and video? 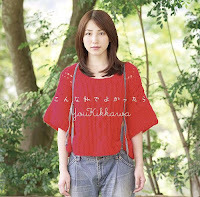 Did you enjoy Kikkawa in 2011, and what is your favourite song from her? Let me know.